You probably got here because you followed a link from the Curaçao Diving Guide; unfortunately the original version of this website is no longer maintained by the owner so the link in the Curaçao diving guide became invalid. Recently (Nov 2016) I was able to acquire the domain name and decided to set up a site with information that can be used in combination with the Curaçao Diving Guide. It is my intention to create a cross reference between the diving sites mentioned in this guide and the names of these sites on available maps of Curaçao so that it is easier to find the dive site while driving around. In a second stage I consider adding driving instructions to get to the dive sites by car. For boat diving sites there are several dive operators that organize boat trips to the boat dive sites. Check with dive operators in the area of the boat dive site if they offer boat trips to the dive site that you would like to visit. 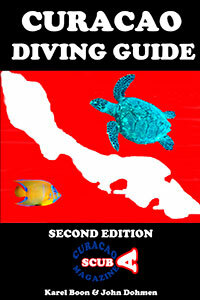 The section Curaçao dive map - dive sites is a work in progress. All the dive sites that are visible on the maps in the back of the Curaçao Diving Guide are also available on the maps in this section. By hovering over or clicking on the dive site number (or hotspot on the main map) a popup will appear with crossreference information about the dive site. Only on the main map there is a clickable link in this popup to go to the specific detail map. On tablet of smartphone a single- or double-tap is required to get the popup. In the section Xref dive sites there is a table with a cross reference between the dive sites in the Curaçao Diving Guide, the corresponding number of this site in the content page of the Curaçao Diving Guide, the page number with detailed information about this site in the Curaçao Diving Guide, the corresponding number on the map on this website and the corresponding number on the Kris Kras road map. A future addition will be also the corresponding dive site number on the Drive & Dive road map. The numbers are all 3 digits to allow sorting on one of the columns in this table. the number 999 means that the entry is not available in the corresponding guide or map. If you still have questions about the dive sites in Curaçao please contact me through the contact page on this web site.